Chemotherapy before surgery shrank triple-negative breast tumors in women in a clinical trial to the point where half of those who had not been eligible for breast-conserving surgery became eligible for it, according to investigators at Dana-Farber and Brigham and Women’s Hospital. The findings were reported at the American Surgical Association annual meeting and in a study in the journal Annals of Surgery. 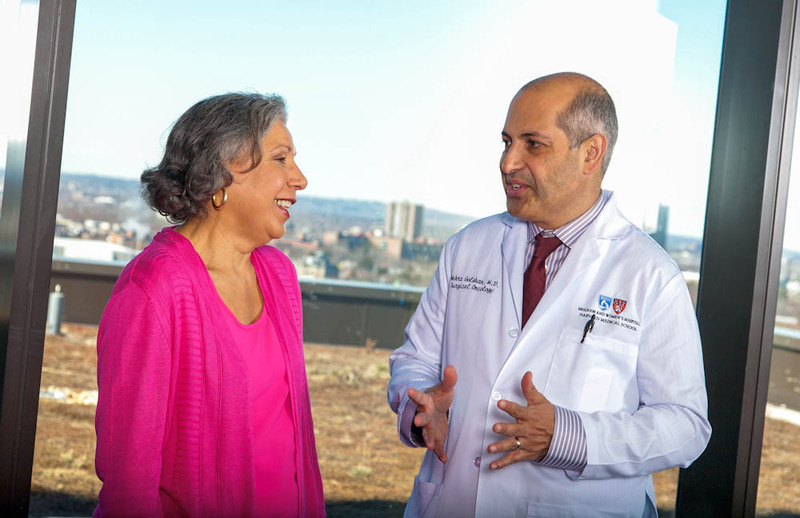 Mehra Golshan, MD, director of Breast Surgical Services with the Susan F. Smith Center for Women’s Cancers at Dana-Farber, speaks with a patient. The study involved 400 women participating in a phase 2 clinical trial of a combination chemotherapy regimen for triple-negative breast cancer, a malignancy whose cells lack receptors for the hormones estrogen and progesterone, and the protein HER2. The trial, organized by the Alliance for Clinical Trials in Oncology, examined whether adding the chemotherapy agent carboplatin and/or the angiogenesis inhibitor bevacizumab to standard therapy would cause the tumors to disappear or decrease in size. Before receiving the drug therapy, 46 percent of the patients weren’t considered candidates for breast-conserving therapy – their tumors were so large that treatment would require removal of the entire breast. After completing the chemotherapy, 42 percent of those patients had so much tumor shrinkage that they were eligible for breast-conserving therapy. The breast-conserving surgery was successful in 93 percent of those who chose it. Even with this success rate, 31 percent of those who qualified for breast-conserving therapy ultimately decided to have a mastectomy – a rather high percentage considering that a major purpose of pre-surgical chemotherapy is to make breast-conserving surgery available to more patients.